The Cult of Ghoul: 22.06.2010.
ovo je stara vest, ali niko je do sada od hororista u srbiji nije provalio, a ionako po svojoj prirodi nije vremenski ograničena da bi bila zastarela, jer se tiče večitih stvari, pa ništa ne gubimo što je tek sada ovde plasiram. 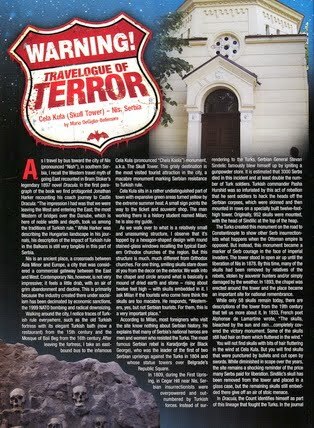 dakle, u jednom od 3-4 najpoznatija (i najbolja) horor magazina na svetu, u kanadskom RUE MORGUE, u broju 75 (jan/feb. 2008), izvesni Mario DeGiglio-Bellemare objavio je simpatičan putopis iz srbije sa akcentom na niškoj ćele kuli, koja je zbog svojih lobanja (i unikatnosti) valjda bila dovoljno egzotična za taj horror magazin. a sigurno je pripomogla i činjenica da ga je u to vreme uređivala srpska ćerka, jovanka vučković. text je vrlo dobar, objektivan, solidno potkovan i blaženo lišen uobičajenog, direktnog ili indirektnog kultur-rasizma u textovima zapadnjaka koji zađu u zemlje 'iza velike šume'. odsustvu predrasuda, podsmešljivosti i sl. svakako pomaže što je 'partnerka' autora texta – srpkinja, pa je tako mogao da se direktnije upozna sa zemljom, istorijom, ljudima, i napiše ovaj sasvim solidan text. ja sam ga priredio za blog (tj. OCR-ovao), a mario je dao svoju saglasnost da se to ovde objavi (uz napomenu da su mu poslednju rečenicu pojeli u prelomu). evo texta koji zauzima 66. i 67. stranu 75. broja RUE MORGUE. As I travel by bus toward the city of Nis (pronounced "Nish"), in southern Serbia, I recall the Western travel myth of going East recounted in Bram Stoker's legendary 1897 novel Dracula. In the first paragraph of the book we find protagonist Jonathan Harker recounting his coach journey to Castle Dracula: "The impression I had was that we were leaving the West and entering the East; the most Western of bridges over the Danube, which is here of noble width and depth, took us among the traditions of Turkish rule." While Harker was describing the Hungarian landscape in his journals, his description of the impact of Turkish rule in the Balkans is still very tangible in this part of Serbia. Nis is an ancient place, a crossroads between Asia Minor and Europe, a city that was considered a commercial gateway between the East and West. Contemporary Nis, however, is not very impressive; it feels a little drab, with an air of grim abandonment and decline. This is primarily because the industry created there under socialism has been decimated by economic sanctions, the 1999 NATO bombing and radical downsizing. Walking around the city, I notice traces of Turkish rule everywhere, such as the old Turkish fortress with its elegant Turkish bath (now a restaurant) from the 15th century and the Mosque of Bali Beg from the 16th century. After leaving the fortress, I take an east-bound bus to the infamous Cela Kula (pronounced "Chela Koola") monument, a.k.a. The Skull Tower. This grisly destination is the most visited tourist attraction in the city, a macabre monument marking Serbian resistance to Turkish rule. Cela Kula sits in a rather undistinguished part of town with expansive green areas turned yellow by the extreme summer heat. A small sign points the way to the ticket and souvenir shop. The man working there is a history student named Milan; he is also my guide. As we walk over to what is a relatively small and unassuming structure, I observe that it's topped by a hexagon-shaped design with round stained-glass windows recalling the typical Eastern Orthodox churches of the region. But this structure is much, much different from Orthodox churches. For one thing, smiling skulls stare down at you from the decor on the exterior. We walk into the chapel and circle around what is basically a mound of dried earth and stone - rising about twelve feet high - with skulls embedded in it. I ask Milan if the tourists who come here think the skulls are too macabre. He responds, "Westerners, yes, but not Serbian tourists. For them, this is a very important place." According to Milan, most foreigners who visit the site know nothing about Serbian history. He explains that many of Serbia's national heroes are men and women who resisted the Turks. The most famous Serbian rebel is Karadjordje (or Black George), who was the leader of the first of two Serbian uprisings against the Turks in 1804 and whose statue towers over Belgrade's Republic Square. In 1809, during the First Uprising, in Cegar Hill near Nis, Serbian insurrectionists were overpowered and outnumbered by Turkish forces. Instead of surrendering to the Turks, Serbian General Stevan Sindelic famously blew himself up by igniting a gunpowder store. It is estimated that 3000 Serbs died in this incident and at least double the number of Turk soldiers. Turkish commander Pasha Hurshid was so infuriated by this act of rebellion that he sent soldiers to hack the heads off the Serbian corpses, which were skinned and then mounted in rows on a specially built twelve-foot-high tower. Originally, 952 skulls were mounted, with the head of Sindilic at the top of the heap. The Turks created this monument on the road to Constantinople to show other Serb insurrectionists what happens when the Ottoman empire is opposed. 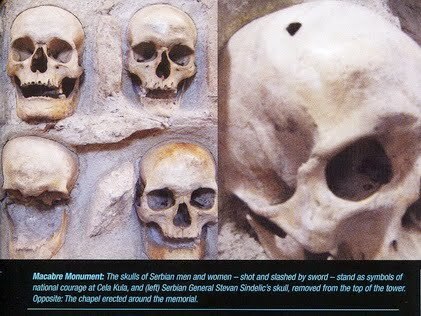 But instead, this monument became a marker of Serb courage in the face of imperial invaders. The tower stood in open air up until the liberation of Nis in 1878. By this time, many of the skulls had been removed by relatives of the rebels, stolen by souvenir hunters and/or simply damaged by the weather. In 1893, the chapel was erected around the tower and the place became an important site for national remembrance. 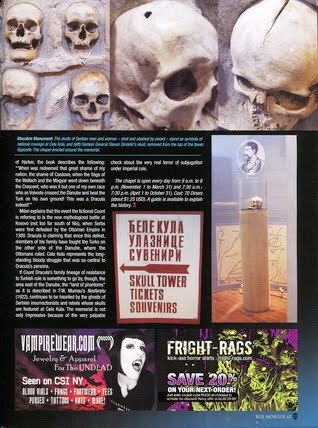 While only 58 skulls remain today, there are descriptions of the tower from the 19th century that tell us more about it. In 1833, French poet Alphonse de Lamartine wrote, "The skulls, bleached by the sun and rain...completely covered the victory monument. Some of the skulls still had hair on them which fluttered in the wind." You will not find skulls with bits of hair fluttering in the wind at Cela Kula. But you will find skulls that were punctured by bullets and cut open by swords. While diminished in scope over the years, the site remains a shocking reminder of the price many Serbs paid for liberation. Sindilic's skull has been removed from the tower and placed in a glass case, but the remaining skulls still embedded there give off an air of stoic menace. In Dracula, the Count identifies himself as part of this lineage that fought the Turks. In the journal of Harker, the book describes the following: '"When was redeemed that great shame of my nation, the shame of Cassova, when the flags of the Wallach and the Magyar went down beneath the Crescent; who was it but one of my own race who as Voivode crossed the Danube and beat the Turk on his own ground! 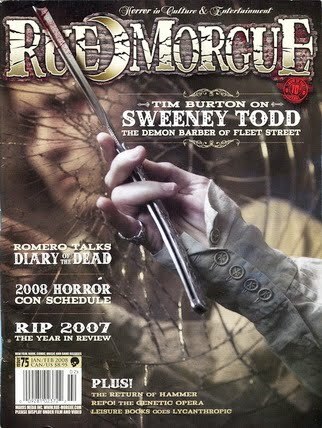 This was a Dracula indeed!'" Milan explains that the event the fictional Count is referring to is the now mythologized battle at Kosovo (not too far south of Nis), when Serbs were first defeated by the Ottoman Empire in 1389. Dracula is claiming that since this defeat, members of his family have fought the Turks on the other side of the Danube, where the Ottomans ruled. Cela Kula represents the longstanding bloody struggle that was so central to Dracula's persona. If Count Dracula's family lineage of resistance to Turkish rule is something to go by, though, the area east of the Danube, the "land of phantoms" as it is described in F.W. Murnau's Nosferatu (1922), continues to be haunted by the ghosts of Serbian insurrectionists and rebels whose skulls are featured at Cela Kula. The memorial is not only impressive because of the very palpable check about the very real terror of subjugation under imperial rule.